point in filing a JIRA item. My gutter is just a mass of red marks. for a test project of 3 modules by IDEA. It is all green. Is it Ok with other XML files (if any)? see no point in filing a JIRA item. I installed 6170 and suddenly my ant integration is completely broken. 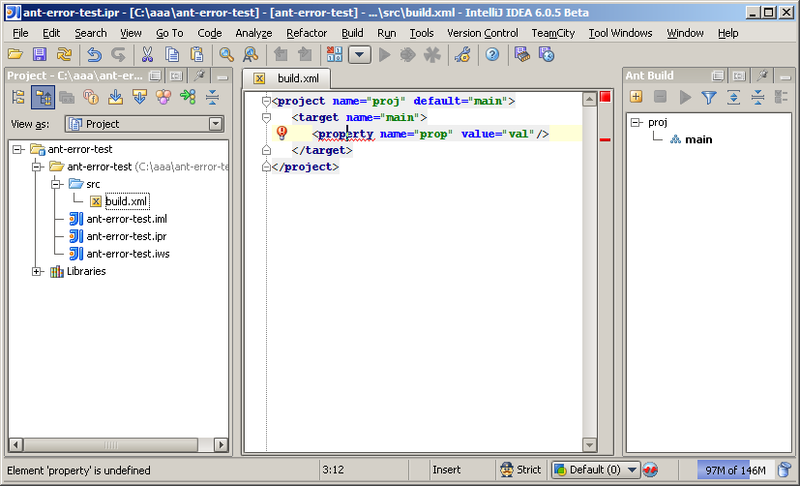 I am seeing a similar problem in Selena EAP 6763. Both of my main Ant build.xml files are lit up like a Christmas tree. IDEA says 'description' and 'echo' elements are undefined. using Selean EAP, and I didn't see this problem in earlier EAPs, for sure it wasn't in 6708 version. "property" is marked as red. See screenshot. The same ant stuff works fine in 6140. On 2007-03-21 11:34:35 +0300, "Mikael Karlsson"
said: >> I see no such defects in 6170. For example, I have generated an ant build >> for a test project of 3 modules by IDEA. It is all green. >> >> Is even simplest script highlighted with red in your environment? E.g. is >> >> >> >> >> >>]]> red? >> Is it Ok with other XML files (if any)? to this news window to keep writing this post, IDEA reported an error. It's submitted as 87809. I haven't seen this error before. All my ant files are lit up bright red since installing 6170. What a mess. On 2007-03-20 16:34:20 +0300, "Mikael Karlsson"
re-install into a space-less path.